Between email updates, text messages, videos, and photos, you’re probably well aware of the fact that your smartphone burns through quite a bit of data every day. However, what you may not know is that your smartphone could be burning through data for stuff you don’t need, like those apps and services that are constantly running and updating without you knowing it. While one little app probably won’t use very much data, those little apps can add up to a serious drain on your data. What is Background App Refresh? Background App Refresh is exactly what its name describes – it allows the apps on your device to automatically search for new information even if they are not actively running on the screen. Battery dying too quickly? Background App Refresh is not helping. In addition to being a drain on your data plan, Background App Refresh can also have a negative impact on your phone’s battery life. While the feature can be useful, it’s not likely that you need up-to-date information on each and every installed app on your phone. 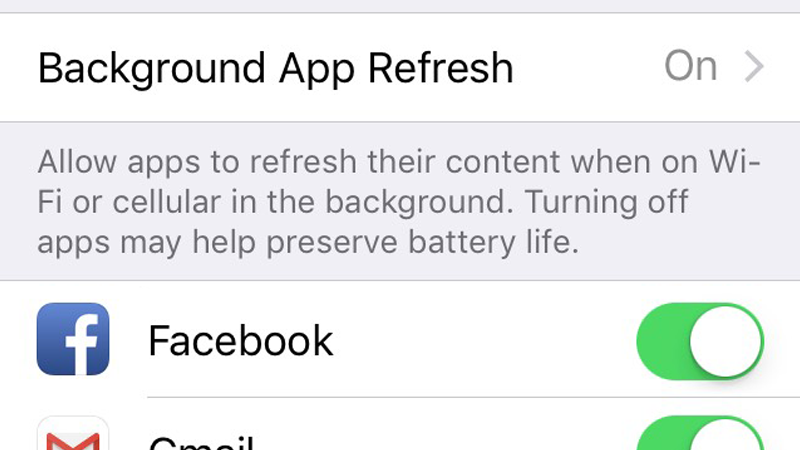 Limiting the number of apps that you allow to use Background App Refresh will be beneficial to your phone’s battery life. Try turning it off on one of the apps that updates frequently (we’re looking at you, Facebook) and see if you experience any improvements.